Make someone smile with this charming butterfly amigurumi doll. Its irresistible cuteness will definitely melt anyone’s heart. It makes for a truly excellent present for loved ones and for any occasion. In fact, this pattern is a great project for intermediate crocheters looking to add cute and unique crocheted creations to their project list. Once completed, the crocheted butterfly doll should measure approximately 6 inches tall. In metric units, the finished amigurumi toy should have a height of approximately 16 cm. 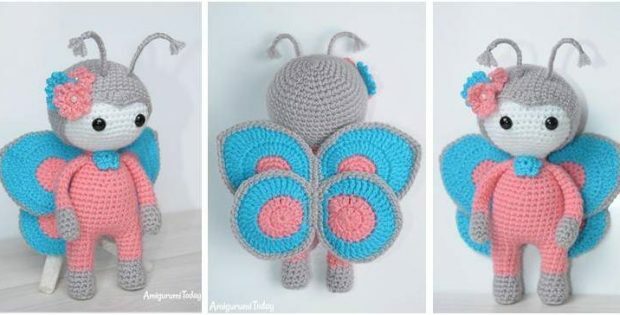 This amigurumi butterfly toy is another lovely creation by the talented designers over at Amigurumi Today. In fact, you can access the FREE pattern for this cute amigurumi butterfly doll from their website. To access the FREE pattern for this charming crocheted doll, please click on this link: Amigurumi Doll In Butterfly Costume Pattern.